Over the past few weeks, my goal has been to appreciate the sufficiency (the word feels woefully inadequate - I hope a better one comes to mind) of God. I do not need to be concerned about anything. “Abraham called the name of that place The LORD Will Provide, as it is said to this day, "In the mount of the LORD it will be provided." Lord, I've prayed to You for so many things in life. For peace as a child in a turbulent home. For a God-fearing husband as an adult. For children to fill our home with joy and enrich our lives. But there's one area I've only recently realized belongs to You, too. Because it all belongs to You. Lord, You've watched me struggle against the scale for as long as I can recall. At times I've had success but it's never lasted. I believe this is because I've attempted to do it on my own, with my limited strength. But what Ive done is taken my eyes off of You and created an idol out of a number, a size. Lord, whatever I am, whatever I'm not, I give it all to you. Help me walk with You in all things. Help me hear Your voice in every moment and decision and to make You and nothing else the central focus and anchor of my life. Lord, whatever Your will is for me - whether it's to lose weight, stay the same, or whatever, help my soul grow with you and help me gain spiritual health over everything else. It's no wonder dieting is a multibillion dollar industry in the US (the latest I read said upwards of $60 billion). It's hard. But most things that are really worthwhile require diligent, consistent effort and more than one attempt to get right. Learning to read. Riding a bike. Watching my sons learn new things reminds me of this often. Good thing they didn't give up when they first tried to walk and it didn't work out. Although, I'd have been fine if the second had waited longer than 10 months to get started! I digress. The thing is, I've fallen and I need to get up and walk again. My weight is up, I'm tired all the time, and I'm eating pretty poorly. It's time to clean up my act. I've got a plan percolating in my head, and the first step is to improve my sleep. I believe being better rested will help me think more clearly and make better choices. That has been true in the past. So, tomorrow I quit caffeinated coffee and tea. I know the Lord will give me strength. I'm going to need it! See that crunchy, chewy crust? Mmm! 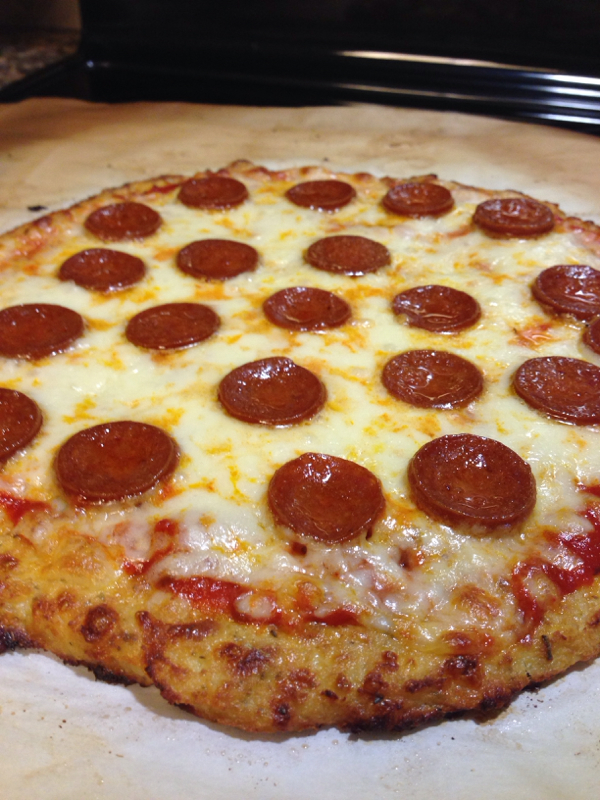 So as I&apos;ve googled "low carb pizza crusts" time and again, I keep seeing recipes for a cauliflower pizza crust. Now if you&apos;ve gone Paleo or low carb for any length of time, the versatility of cauliflower (in lieu of rice, mashed potatoes, or to purée and thicken soups/sauces) can&apos;t be questioned. It&apos;s a great veggie. But don&apos;t mess with my pizza! So anyway, cauliflower pizza crust. 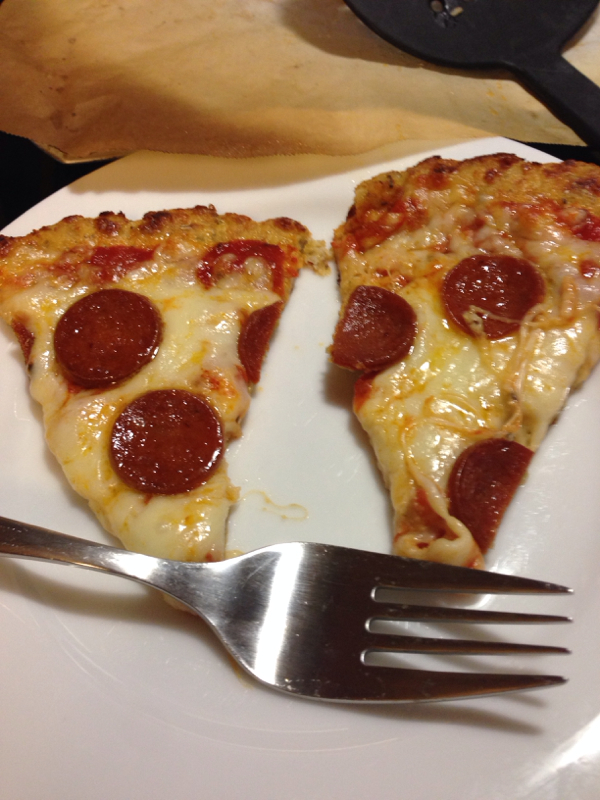 I found this recipe: http://www.theluckypennyblog.com/2013/02/the-best-cauliflower-crust-pizza.html?m=1. She calls it the best, so why would I start with anything else? Well, because I&apos;m me. I can&apos;t help but tweak. And I found a similar recipe from Paula Deen (must be a post-diabetes diagnosis recipe). So I combined them. The wringing out of the cauliflower from Lucky Penny, and the increased mozzarella in the crust and baking temp of Paula&apos;s.
I should&apos;ve waited 4 or 5 minutes before cutting it, as I noticed it held together better after sitting longer. But I was impatient! As for another opinion, my resident pizza lover told me it was better than the almond flour one he&apos;s been perfectly happy to eat in recent months. Score. So that&apos;s my story of cauliflower pizza crust. After two more minutes, I didn't need the fork. I love to get surprises in the mail. I imagine most of us do, provided they're welcome surprises. 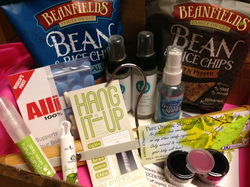 Once that always is welcome is my Ecocentric Mom box of the month. Ecocentric Mom offers a reasonably priced subscription service to one of three boxes: the Mom Discovery box, the Mom-to-Be Discovery box, and the Mom & Baby Discovery box. Each box has half a dozen or so products - generally a mix of trial size and full size - curated by their experts to help support a healthy, eco-conscious lifestyle. My Mom Discovery box costs me $17/month, including shipping. Hang It Up Eco Friendly Bamboo Hanger - a regular size straight hanger, cleverly designed to hold scarves, ties, tights, belts, and more with the elastic borders that run flush to the hanger. Tru household cleaner - two ready to use 2 oz. bottles (also sold as concentrate) that are designed to be used on pretty much any kind of mess. I love the diaper bag friendly size! Real Purity Lipstick - all natural, and richly pigmented. I'm a girly girl, so lipstick is a favorite product of mine. This one, in Regal Red, is on the raspberry side of red. It's vibrant and suits my fair complexion well, though I think it would suit many other colorings well, too! Eve Organics Balance Moisturizer - my skins tends more toward oily, so this will be perfect for winter. My sensitive skin had no problem with it, and it smells heavenly due to the inclusion of essential oils of ylang ylang (a fave of mine) as well as jasmine, rose, and others! Other goodies included a full-size Bella Organics lip balm in Apple (yum! ), Eve Organics hand sanitizer (another diaper bag item!) and two small jars of their Balance Moisturizer, a 4-day supply of Allimax (a garlic supplement), two snack size bags of Beanfields Bean and Rice Tortilla Chips (non-GMO goodies for emergency toddler snacks! ), and TravelSpritz hand sanitizer. Full disclosure - if you choose to follow the link to Ecocentric Mom's site above and make a purchase, I receive a small profit, which does not increase your purchase price. That said, the opinions shared here are my honest thoughts on the products received. While I'm hopeful that my photography skills improve with the practice they're sure to get from this site, I have to admit my banner image is making me hungry for citrus carnitas and guaca-slaw. The carnitas are the creation of Melissa Joulwan, who wrote a fantastic cookbook called Well Fed. It literally propelled me through a Whole30 I did after my son was born (basically, no sugar, no grains, no dairy, no legumes - more details here). Everything I made from it was delicious. So with such a fantastic entree, I was inspired to create a worthy side dish. I just so happened to have a huge head of Napa cabbage from my CSA that I needed to use. Voila - guaca-slaw was born! Combine the cabbages and onion in a large bowl (preferably not metal). In a smaller bowl or 2 cup measuring cup, combine the cumin, garlic, salt, pepper, and lime zest/juice. Once combined, drizzle in olive oil, stirring with enthusiasm to emulsify. Add the jalapeño and cilantro to the dressing, then pour over the slaw mixture to dress it to the extent you like. For the best flavor, allow this to hang out for a half hour or so (or make ahead and store in the fridge, removing at least 15 minutes prior to serving.) Served garnished with avocado (leftovers keep better with the avocado stored separately). Bienvenue! Wilkommen! Bienvenidos! Okay, that's all I've got. But I really wanted you to know I'm glad you're here. This is my first official post after I agonized for a week or two over the name of my site. If you want to know more about me and how I picked it, please visit the About Me page. I have plans for recipes, product reviews, and recommendations of other resources that are helping me live a healthier life (as a former English major, I totally take credit for that awesome alliteration.) I look forward to hearing comments from you, dear readers, about your experiences and life lessons as we learn together to live healthier lives!